The Illuminator is now on sale exclusively at YoTricks.com. After last week’s announcement that we had yo-yos for sale we received a number of emails asking about the Illuminator. Today we are pleased to announce that we now have Illuminators in stock and they are available for immediate purchase from our shop. 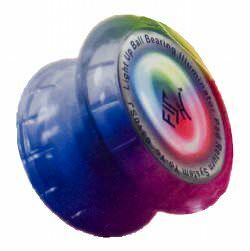 The Illuminator is a clear Luminator yo-yo with multicolored lights on each side. The perfect yo-yo for performing or just showing off.